With the continuous increase in popularity, many would assume that Cannabidiol (CBD) is legal to purchase worldwide. There are hundreds of online options and most packages will arrive at your door without any problem. But this doesn’t mean CBD is legal to produce, purchase and distribute in all types and forms. IS CBD THE SAME AS WEED? CBD is a chemical compound found in the cannabis sativa plant. These are referred to as “cannabinoids”. This does not, however, mean that both plant and chemical are the same thing. While you can isolate CBD from cannabis, you cannot have cannabis without CBD. Cannabidiol is one of the dozens of cannabinoids present in the cannabis plant. But what distinguishes this one from the others, especially the notorious THC, is the fact that it’s not psychoactive. This means it won’t be giving you the traditional cannabis “high” nor any of the expected effects. This is why CBD’s usefulness lies mostly on the therapeutic and medical markets. WHAT IS CANNABIS AND CBD OIL? Cannabis oil is obtained when you separate the resins from the plant material using a solvent extraction process. This means that you can obtain a liquid solution with the full benefits and effects that the plant provides. After extracting the oil, what’s left are pure plant fibres with no compounds. Cannabis oil is the purest and strongest method of smoking cannabis. With it, you can also make pretty much anything from capsules to brownies to tea. CBD oil is essentially the same exact thing but stripped down of every other cannabinoid so that it just includes CBD. Obviously, no product out there can be 100% CBD but most manage to get around 99% purity. 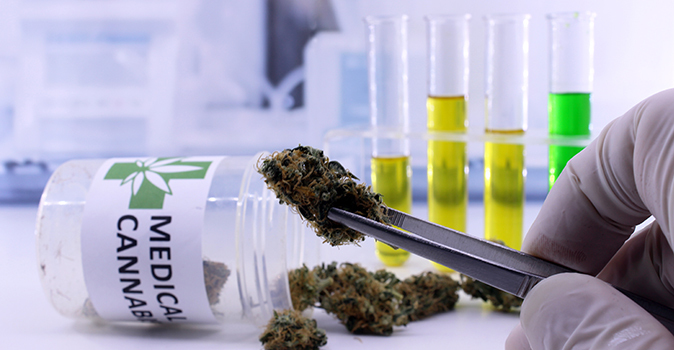 This makes CBD a viable option for medical patients who don’t consume cannabis by choice. Having to smoke a joint to get your medicine would be controversial especially in minors and elders. More so if that also includes THC. But we’ve been able to isolate the chemical compound and administer it safely to patients. So, let’s see what cannabidiol can do for them. 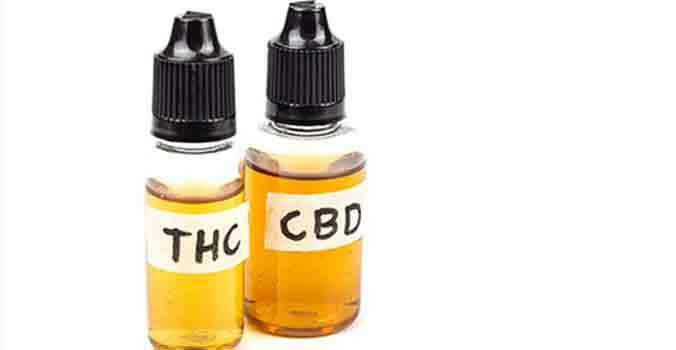 ¿WHAT ARE THE MEDICAL USES OF CBD? Even though the cannabis plant contains dozens of cannabinoids, CBD is the one to have the most medical applications. It even sounds ridiculous how helpful this Cannabidiol can be but everything we’re about to list is true. One of the most useful advantages of CBD is it’s anti-inflammatory and pain-reducing effects. There were almost 200 million opioid prescriptions in the U.S. in just 2017. This is a huge number of people risking their lives for pain relief. Almost all of these prescriptions could’ve been replaced by CBD. It’s much safer, non-addicting and impossible to overdose on. CBD is also great in helping people with epilepsy. Seizures happen when there’s an increase in electrical activity fluctuation in the brain. CBD can help calm the brain down and decrease the overall number of seizures. The New England Journal of Medicine looked at how CBD affected people with Dravet Syndrome (a rare type of epilepsy). The study concluded that there was an average decrease in seizures of almost 40%. As stoners, we’ve all probably heard or read the following affirmation: “Cannabis cures cancer!”. Well, this might not be exactly true but CBD does help. An article published by the British Journal of Clinical Pharmacology states that Cannabidiol can be used to slow down and sometimes even stop the growth of the disease as well as promote the destruction of cancer cells. After almost 100 years of misinformation regarding cannabis, a lot of people can’t tell the difference between marijuana and hemp. Just because they’re visually similar does not mean they are the same plant. Let’s look at their differences. Cannabis is not a plant but rather a family of plants. This may be news to a lot of people out there but cannabis and marijuana are not the same thing. Marijuana is just one type of cannabis. There’re two families of cannabis which you’ve probably heard of: Indica and Sativa (not to be confused with strain types, these are different). Hemp and marijuana are both included in the Sativa family. It’s because of this that they share a lot of similarities but to an expert, they are very distinct. Hemp has very thin leaves and branches and is much less dense than marijuana. If you were looking at hemp plant it was marijuana, you’d probably think it was a poorly grown plant. The main difference isn’t in the visual aspects of the plants but in the chemistry inside them. While THC is the main chemical compound found in marijuana, no more than 0.3% can be found in hemp. This makes hemp unusable for recreational purposes while still maintaining a fair amount of CBD that can be used medicinally. The simple fact that hemp exists is the only reason why so many people around the world have access to CBD. If cannabidiol was only accessible through marijuana, the world of CBD medicine would be completely different if not obsolete. Hopefully you now understand well what CBD is, what it’s used for and where it comes from. With that in mind, we can now start to understand the complex beast that is CBD regulation. Let’s start with one of the most complex countries: The United States of America. This is the country where in one state you can be arrested for several years just for possessing one gram of marijuana while in a neighbouring state you can legally purchase kilos of 99% THC concentrates. 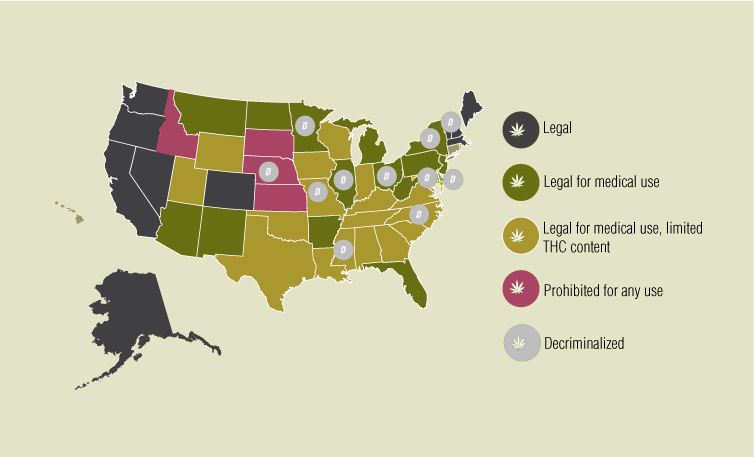 In these states, where medical and recreational cannabis has been legalized, CBD is obviously legal. We’ll be discussing what the legislation is at the federal level. Halfway through 2018, the FDA approved the first drug to be derived from marijuana to treat two rare and very severe forms of epilepsy in children. But the DEA isn’t on the same page yet. At the federal level, CBD products are only allowed under very specific conditions. The cannabidiol must’ve been extracted from hemp with less than 0.3% THC for it to be legal. And that sounds fair enough until you look at the 2014 Farm Bill which stated the allowed forms of Hemp to be grown. In the U.S. you can only grow hemp under a state pilot program or for academic research. And considering the popularity of CBD in the last year, it’s fairly safe to assume that not all products available are sourced in accordance with the 2014 Farm Bill. So, the question now isn’t necessarily if CBD is legal or not, because it is at a federal level. The legality of it depends on where it came from and whether the plant was grown legally or not. CBD is a fairly recent discovery so a lot of countries don’t have it specified under regulations. In most places, Cannabidiol is only sold because it’s not stated directly as illegal but it does not mean that it’s legal. Then you also have countries where decriminalization deems cannabis only illegal to sell and not consume which means if you order it online and it arrives at your door, then you won’t have any problem using it. If you live in Asia, you’ll probably have a hard time finding CBD in a local shop. Cannabis has been decriminalized in Iran and Russia so you might as well try and order it online. If it gets stuck in customs, just leave it so you don’t risk having to give any explanations. But if it arrives at your front door, then you are good to go. A lot of countries in South America also share this legislation. Only Bolivia, Paraguay and Ecuador amongst a couple others still consider it a crime to possess. Unfortunately, if you live in Africa, you should probably stay away from CBD for now. There’s a lot of missing information about most of these countries regarding cannabis so don’t try to order it online. If you can find it locally, ask around what experience people have had but don’t get too comfortable. And the same goes for all of you in Australia. A couple of states have decriminalized Victoria has legalized medical use but at a national scale, CBD is not yet legal so be careful. BitCanna Accepted Soon At Zambeza!